A few anglers get ready to head out onto Miller Lake. The dark art of ninja fishing involves moving like a shadow along the shoreline, getting as many casts out in one location as possible, and then escaping before you get massacred by a gang of miniature vampires. Ninja fishing is not always effective. Sometimes, you want to stay in one good spot. And sometimes, the mosquitoes are going to find you no matter how quickly you move. The key is to combine bug dope, quick movement and the mental acceptance that you’re almost certainly going to be an itchy mass of welts by the day’s end. Fishing can be fantastic in the Cascade lakes this time of year, meaning that anglers will endure almost any discomfort for a trophy trout on the end of their line. Such was the case at Miller Lake, a large body of water at 5,600 feet in the Winema National Forest near Chemult. 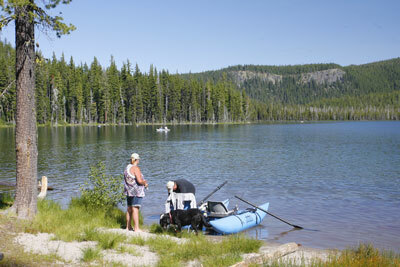 The lake is located 12 miles off Highway 97 on dirt road 9772 (Miller Lake Road). By the time I arrived at Digit Point Campground, the main access point to Miller Lake, it was obvious that this 600-acre lake in the volcanic flatlands north of Mount Thielsen was a popular destination. The campground was a beehive of activity with both bait and fly-anglers getting boats or small pontoon floaters onto the water. To judge from the array of fishing methods on display, just about any type of bait worked for the rainbow trout, brown trout and kokanee salmon that populate the lake. Those with larger boats spoke of trolling spinners and nightcrawlers in the deeper water, while a number of fly-anglers drifted along the shoreline near the campground. And just about everybody seemed to be catching fish. I myself was without a boat. All I had was a breakdown fishing rod and a few simple trout lures. With the high number of people around the campsite, I decided to head onto the five-mile trail that circles the lake. Now, considering my focus is usually fly-fishing for steelhead on the Rogue River — a practice where you can toss a few million casts and not get so much as a bite — I was a bit surprised by just how often the fish were hitting. About half a mile down the trail, where a small creek entered the lake, I started tossing out a silver spoon. On my third cast — no, seriously — I got a strike and landed a fat, 14-inch rainbow trout. Not bad for 10 minutes of fishing. The mosquitoes were beginning to get clued into my location, so using the ninja method I moved farther down the trail and tried a new spot. Ten minutes later ... BAM ... another rainbow trout. For a person who has struggled tooth-and-nail to catch much of anything during recent months, this was beginning to feel like cheating. Eventually the fishing slowed down and I decided to experience another of this area’s highlights. Miller Lake is located just a few miles away from Maidu Lake, a pretty little slice of blue in the volcanic forest that’s also the source of the North Umpqua River. I figured the birthplace of one of my favorite Southern Oregon rivers was worth the three-mile hike. Plus, the lake apparently has a good amount of brook trout. I followed the Maidu Lake Trail uphill, crossed into the Mount Thielsen Wilderness and dropped into the lake’s small basin. Remember how I was complaining about the bugs at Miller Lake? Maidu Lake, as far as I can tell, is the Grand Central Station of mosquitoes in the Cascades. This wasn’t just a casual annoyance — this was arms blanketed with buzzing black sleeves. After less than five minutes, I gave up fishing and headed back to Miller Lake with my tail between my legs. For two more hours I went back to ninja fishing at Miller Lake and caught two more rainbows. The day ended with four fish caught-and-released, and roughly 1.7 million mosquito bites. Not a bad day in the High Cascades.